It’s taken Mercedes-Benz a long time to launch a mid-sized SUV in Britain. The GLC’s predecessor wasn’t engineered for right-hand-drive markets, but that oversight has been corrected with this model. So, what tow car ability does it have? We’ve been towing with the 201bhp 250d 4Matic AMG Line, the most powerful diesel-powered model. Was the GLC worth waiting for? How well does it tow and is it as practical as its best rivals? Read on! For a mid-sized SUV, the Mercedes-Benz GLC 250d has a high kerbweight of 1845kg. That’s good news for matching ratios, giving the Merc an 85% match figure of 1568kg. That’s well within the 2500kg towing limit. We matched the GLC to a Swift Challenger 635 with a Mass in Running Order of 1540kg. Within the first mile or so it was obvious that the GLC’s 2.1-litre diesel engine had strength to spare. It accelerated with ease, and held speed on steep gradients with no need for a heavy right foot. Our first impressions were backed up by the car’s performance at the test track, where the GLC sprinted from 30-60mph in 10.1 seconds. With 369lb ft of torque available from 1600rpm to 1800rpm, and a slick-shifting nine-speed automatic gearbox to keep the engine working effectively, it’s no surprise that the Merc is so quick. It’s a shame the GLC doesn’t stop as well as it goes. Although the brakes felt fine in normal towing, in an emergency stop from 30mph it took 11.1 metres for car and caravan to come to a halt. That’s a middling performance for a car that otherwise tows so well. The Merc was back on top of its game in the lane-change test. Body roll was kept under control and there was no sense that the caravan was pulling the back of the GLC off line, however hard we swerved. More consistent steering would have helped the driver place the car with greater precision, though. 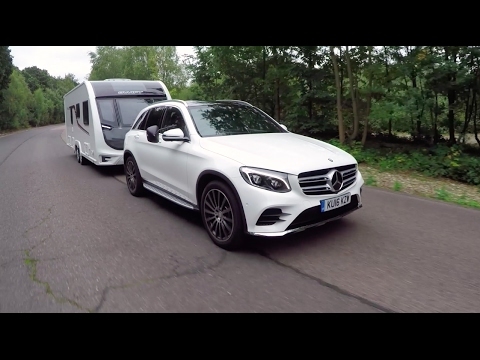 On the track or on the road, 60mph felt very tame when towing with the GLC. Our car was fitted with air suspension (a £1495 option), and in either Comfort or Sport settings we had no complaints about the Merc’s straight-line stability. We know what tow car skills this Mercedes-Benz SUV has, but what's it like as an everyday car? Choose AMG Line specification and your GLC comes with sports suspension, unless you opt for air suspension. Then you have a choice of settings. It ought to be the best of all worlds, but we’re not convinced. Comfort mode is forgiving enough on relatively smooth roads at low speeds, but feels a little floaty at higher speeds. Despite this looseness, big bumps are felt and heard with a thump. In Sport mode the car is better tied down, but imperfections are felt more. Sport+ is a little too stiff and jittery for UK roads. The GLC also has variable-ratio steering, another feature we didn’t get on with because of its inconsistent response. Performance is excellent, but less engine and road noise would make the Mercedes GLC a better long-distance cruiser. For the past couple of years or so, Mercedes-Benz has really set the standard for interior design and finish. Next to the GLC, the cabin of a BMW X3 or a Land Rover Discovery Sport looks quite ordinary. However, we were disappointed to hear some creaks when driving on bumpy roads. Legroom for the driver is more than generous, although even with the seat at its highest the position is low-slung for an SUV. However, it was comfortable. There’s enough room in the back for adults to travel in comfort, and air vents between the front seats keep rear-seat passengers happy. The 550-litre boot capacity looks generous, but it includes the space beneath the boot floor – the main luggage area is shallow. The Mercedes GLC is pricey, even by the standards of upmarket SUVs. However, your £40k buys a long list of standard equipment. This list includes satellite navigation, artificial leather upholstery, 19-inch alloys, a digital radio, a 7.0-inch colour display, a powered tailgate and more. Safety kit is also comprehensive, and the car has a maximum five-star rating from Euro NCAP. Respectable running costs should help soften the blow. The official combined figure of 56.5mpg is excellent and we achieved 26.6mpg while towing. Resale values are expected to be strong. Our colleagues on What Car? predict the car will be worth 49% of the original price after three years and 36,000 miles. As a tow car, the Mercedes GLC is very impressive. Stability at speed and acceleration are both very good. However, some rivals are sharper to drive or more practical. The long-awaited GLC is a capable all-rounder, but it isn’t a class-leader.